Department of Recreation and Parks Assistant General Manager Kevin Regan speaking at today's groundbreaking. Seated are, left to right, Public Works Commissioner Steve Nutter, Deputy City Engineer Deborah Weintraub, Councilmember Ed Reyes, Recreation and Parks Commissioner Barry Sanders, Councilmember Tom LaBonge, Council President Eric Garcetti, and Bureau of Sanitation director Enrique Zaldivar. Another perfect Los Angeles day for another good step forward for Los Angeles River restoration and revitalization. It was a clear crisp cloudless fall sky – the kind of light that shimmers on flowing waters and shaking leaves and gives us a glimpse of just what an extraordinary natural treasure the L.A. basin was… and can again be. A crowd of over a hundred – mainly Atwater neighbors, creek freaks, and civil servants – assembled for the groundbreaking ceremonies for the North Atwater Park Expansion and Creek Restoration. Hosting and quarterbacking was Los Angeles City Councilmember Tom LaBonge, in whose district the project is located – though it will serve all Angelenos, especially Council President Eric Garcetti’s constituents, who live adjacent to the site. Rounding out the dignitaries speaking and shovelling were: Councilmember Ed Reyes, Deputy City Engineer Deborah Weintraub, Public Works Commissioner Steve Nutter, Recreation and Parks Assistant General Manager Kevin Regan, Recreation and Parks Commissioner Barry Sanders, and Bureau of Sanitation Director Enrique Zaldivar. > Tomorrow Saturday October 23rd 2010 is the monthly Community Open House for touring the Ballona Ecological Reserve. These guided walks leave from the Fiji Gateway at 9:30am, 10:30am, and 11:30am. The Fiji Gateway is at 13720 Fiji Way, Marina del Rey, CA 90292, across from Fisherman’s Village. > The city of Los Angeles Community Redevelopment Agency and Planning Department are hosting a meeting on both the Cornfield Arroyo Seco Redevelopment Project Area and the Cornfield Arroyo Seco Specific Plan. It takes place tomorrow morning – 10:30am Saturday October 23rd 2010 at the Los Angeles Conservation Corps, 1400 North Spring Street, LA 90012. Creek Freak wrote about the CASP earlier here. I am hoping that the CASP is intact and on-track to be approved next week! I don’t know much about the CASRPA… and hope to learn about it tomorrow morning. > Moonlight Magic, the Friends of Madrona Marsh annual fundraiser is also Saturday October 23rd 2010, from 6:00pm to 10:00pm. The Friends are a volunteer driven stewardship organization that has a regular schedule of restoration and education activities at the marsh, located in Torrance. Tickest are $50. > On Sunday October 24th at 4pm, L.A. Yellow Box and Friends of the Los Angeles River host a screening of the documentary Bag It. Details at the Facebook event page. Watch the preview on vimeo – looks very good! > On Thursday October 28th at 2pm, celebrate the city of Los Angeles groundbreaking for the North Atwater Park Expansion and Creek Restoration. It’s at North Atwater Park, 3900 Chevy Chase Drive, Los Angeles 90039. Creek Freak wrote about this project briefly earlier here and here. Fortunately, the perfect map of Los Angeles – the Borgesian map of all romantic maps – is already in your possession, just outside your door. Its scale is 1:1, and you will need good shoes. >The Los Angeles Times Greenspace Blog entry Trapping the Rain highlights the Natural Resources Defense Council’s new report A Clear Blue Future: How Greening California Cities Can Address Water Resources and Climate Challenges in the 21st Century. The report is about Low Impact Development “LID” and how we can build smarter to save water and energy. >Los Angeles westside property owners can trap your own rain if you apply for the city’s new rainwater harvesting program. If you’re looking to set up your own rain harvesting system (like Homegrown Evolution details here) check out creek freak’s favorite water harvesting expert Brad Lancaster‘s recommendations for selecting the least toxic hose. >Homegrown Evolution reports on the recent approval of California’s smart new greywater law, designed to make it easier to reuse your greywater. Greywater is “used” water from your washing machine, sinks or showers. Mr. Homegrown will be teaching a greywater workshop this Sunday – see below. Soak in creek freak’s washing machine greywater system here. >The San Gabriel Valley Tribune covers the new master planning underway for the Whittier Narrows Recreation Area – 1200 acres where the San Gabriel River and the Rio Hondo squeeze together behind the Whittier Narrows Dam. Also, the Pasadena Star News reports that the Altadena Foothills Conservancy is doing the early planning work to create a new trail system along the Eaton Canyon Wash, which could connect from the foothills above Pasadena all the way down to the Whittier Narrows. >The Los Angeles County Sanitation District website profiles the Bixby Marshland – a 17-acre remnant wetlands located near the intersection of Figueroa and Sepulveda in the city of Carson. They’re looking for volunteers to help steward the site. >The City Project is about to unveil new proposals for Griffith Park on the East Bank of the Los Angeles River – a future Los Angeles River park on the Los Angeles City Recreation and Parks 28-acre Central Service Yard, located at the end of Chevy Chase Drive in North Atwater. 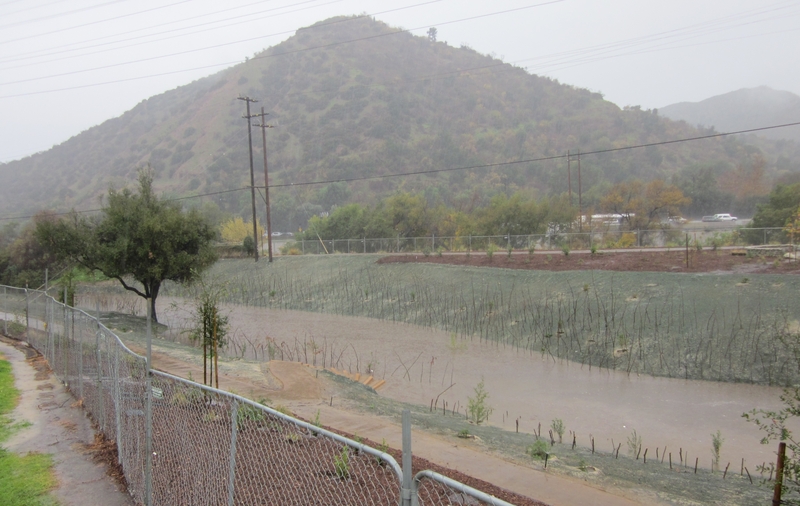 The city is already planning to restore a small remnant creek in one corner of the site. >Federal stimulus money is helping make the Los Angeles River healthier (though creek freak would like to see it do a whole lot more!) Funds are being used to provide trash capture devices that prevent trash from getting into the river (via Spouting Off.) They’ll be installed in about a dozen downstream cities from Vernon to Montebello to Long Beach. There’s also some federal funding planned for reworking the “Shoemaker Bridge” where the 710 Freeway crosses the Los Angeles River near downtown Long Beach. The project includes doubling the size of Cesar Chavez Park. Let’s hope that it doesn’t hasten the expansion of the rest of the 710 Freeway – a huge threat to restoration on the lower river. >An odd little video featuring a homeless man fishing by throwing rocks into the Los Angeles River (thanks Jeff Chapman.) 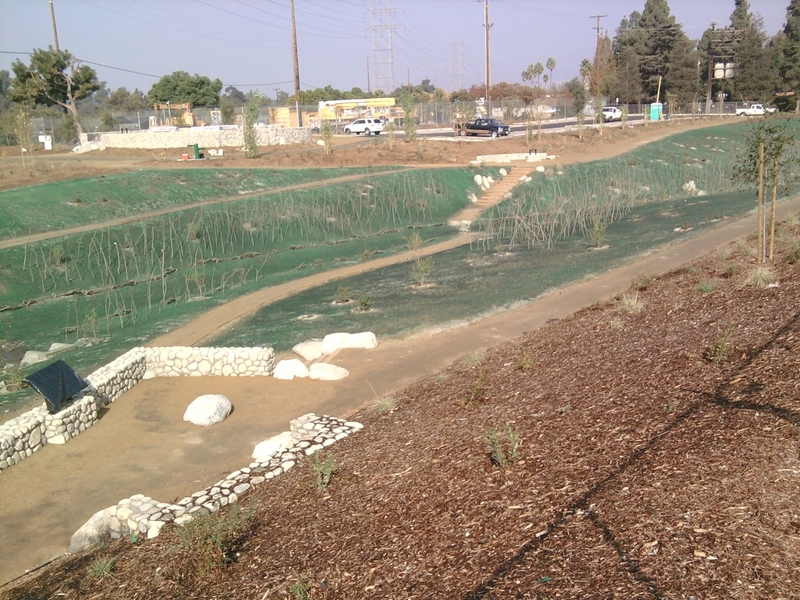 See creek freak’s earlier post on fish in the L.A. River. >The excellent documentary movie Tapped shows today and tomorrow at the Arclight theaters in Hollywood. Showtimes here. Creek Freak’s review here. >Friends of the Los Angeles River is hosting a few upcoming Los Angeles River clean-ups. On Saturday August 22nd they’ll be at the Sepulveda Basin, and Saturday August 29th at Taylor Yard. There will also be river sites at this year’s Coastal Clean-Up Day coming up on September 19th. You are currently browsing entries tagged with North Atwater at L.A. Creek Freak.